Has the best smell. I love using this. Mountain Mint Plant is an herbaceous perennial. Mountain Mint Plant white-edged stems have silver leaves and an overpowering mint scent. The hairy stems make this one of the most fragrant plants in the US. The Mountain Mint plant has a variety of uses. This plant can be used to freshen your clothes in the dryer when a small bag is filled with the leaves of this plant. It has also been known to help with toothache pain and also is good to stop pains in wounds on the skin. The Mountain Mint Plant, an herbaceous perennial, is, as the name suggests, is a plant belonging to the mint family. 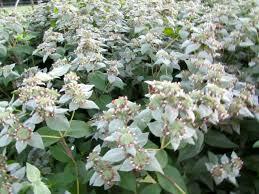 Mountain Mint Plant is a beautiful plant with white edged stems, and the leaves are silver in color, hence the name. In fact, the silver tone resembles as if someone sprinkled some dust on them. When several of Moutain Mints are planted together, they have a fantastic look. Mountain Mint Plant stems have a fluffy texture to them and will have a strong mint aroma. Mountain Mint Plant has been widely planted for both, cosmetic reasons as well as for its refreshing air qualities. In fact, Native Americans used them for medicinal purposes also, such as curing toothaches and fevers. They are also famous for their butterfly attracting quality and low maintenance. This variety of mint plant is straightforward to grow, only requiring minimal maintenance and upkeep. The flowers show up in summer and are usually pink in color. Mountain Mints are small flowers clustered together on top, resembling a bouquet. Each cluster will have two leaves extending making it look like a propeller. The silver mountain mint propagates itself through rhizomes, like most mint plants. This herb is indeed a plant it and forget it type.